Today the library of Bantam and Del Rey STAR WARS novels will be available in all eBook formats at Random House. 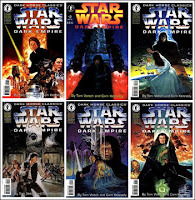 Beginning today, just as it was previously announced, you can get the entire catalog of Random House’s Star Wars novels on digital format. This is a great opportunity to enjoy all of your favorite books on your e-reader or even on your computer.